There are a lot of things that are "broken" that I'd argue are working as designed. The economics of agriculture are in that category. 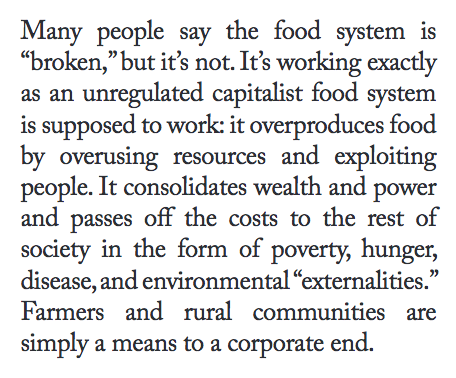 The above quote is a screen shot from a pdf titled "Parity and Farm Justice: Recipe for a Resilient Food System"
Parity is the idea of a "fair price" for farm commodities. The "market" isn't able to pay anything near the cost of production for many commodities. The large players have destroyed what worked in the early days of the Farm Bill and replaced it with something that preserves their access to a seemingly endless supply of cheap inputs. It doesn’t have to be this way. We can make parity a household word. 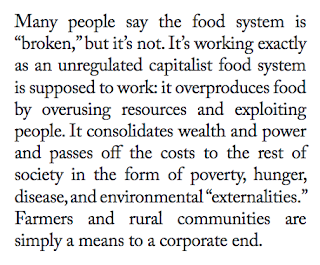 It’s as simple as believing in a living wage for farm workers, and a just food system. Even the "winners", at this moment organic grain/meat producers (though not dairy), are forced to play by these rules and will eventually be incorporated into the larger system. The subsidies in place now are solely for crop insurance. So a failed crop ensures payment to the providers of inputs without putting anything in the pocket of the farmer. It's a big subject. I'd encourage the few people who read this blog to continue to ask questions. Cultivating Corn, Central Ohio. 1938.